I am usually pretty good at organizing and following my constantly updated to-do list. But once in a while life does get overwhelmingly busy and I fail to plan ahead especially when juggling too many things at the same time. What ends up happening is I call my husband at the office asking him to meet me and the kids at a restaurant for dinner at the last minute. One of the drawbacks of not cooking dinner at home is that I don’t have “leftover” to pack for my son’s bento (lunch box) the next day. I try to save some leftover in the freezer for an emergency like these, but sometimes no luck. On those days, the easy sandwich comes in handy. Now for those living in the States, a peanut butter and jelly sandwich might be a common menu for children’s school lunch. However, both of my children always preferred hot panini sandwich than typical soft bread sandwich like these. The turning point was when we were in Japan last April. My mother loves bakeries and we often visited many local bakeries to pick up fresh bread. My children really enjoyed freshly baked bread from Japanese bakeries and they especially loved Egg Salad Sandwich, or we call it Tamago Sando (たまごサンド). 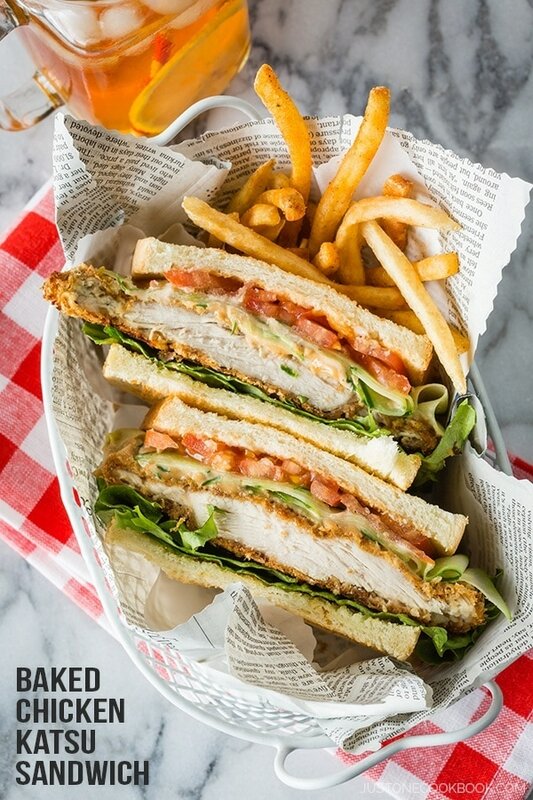 Japanese sandwich usually uses crust-less white bread slices, probably from British influence. 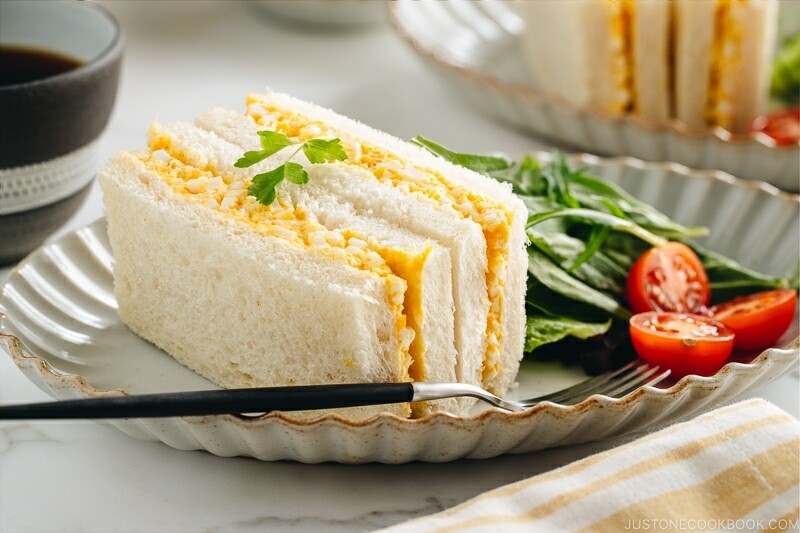 Compared to typical American egg salad sandwich, the Japanese version is very simple – there are no celery, chives or green onions. 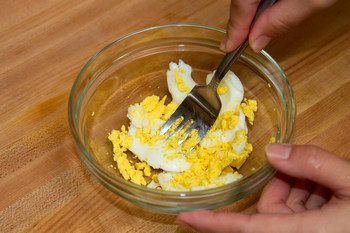 The eggs are seasoned simply with Japanese mayonnaise, salt and pepper, and sugar. Now speaking of mayonnaise, I receive several questions from some of you about Japanese mayonnaise. What’s the difference from regular kind? Well, you can read more about it here. 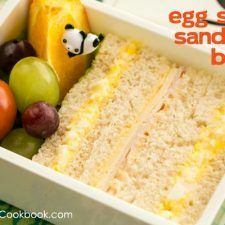 My son loves this Egg Salad Sandwich and this menu is now one of my favorite backup bento plans. I hope you will give it a try and enjoy this simple egg salad sandwich! Check out my latest Japanese Egg Sandwich (Tamago Sando) recipe and video! Simple and delicious Japanese egg salad sandwich with mayo, salt, and pepper. Perfect for a quick lunch. In a small bowl, mash the boiled egg with a fork. Add 1 Tbsp. of mayonnaise and mix well. If it's not moist, you can add 1/2 Tbsp. more. Season with salt and pepper (and sugar if you like). I like to add salt and pepper a bit more than what I usually add to give good flavor. Spread the egg mixture on top a piece of bread and put another slice of bread on top. 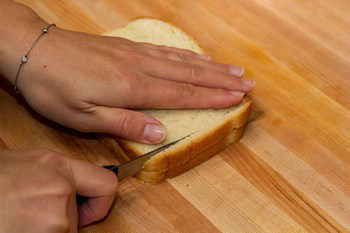 (Optional) Cut off the edges of the bread. Japanese sandwiches usually don’t have edges. 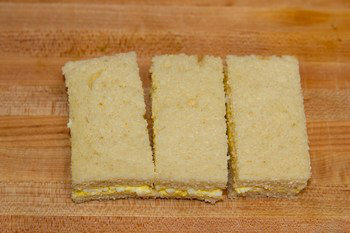 Cut the sandwich into 2-3 parts depending on the bento box size. 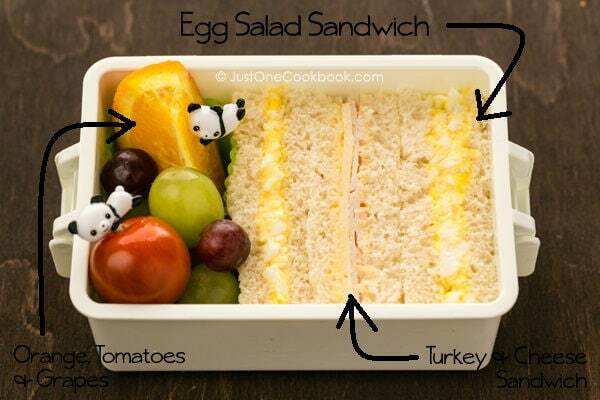 Pack the sandwich in bento box and put some fruits and vegetables in the empty space. Sugar: A little bit of sugar is a typical ingredient for Japanese egg salad, but I usually don't add it. This lunch is for my 6-year-old son. So adorable, as always. Great solution for a fast fix. Nicely done. So simple and so cute, I love it Nami! another bento my son would love! What a coincidence! I just boiled some eggs for my lunch and now I’m craving this egg salad sandwich after reading your post. Our own version is similar to yours, too – quite simple with just mayo, salt and pepper. But I love the bread you used and removing the crusts is just perfect. 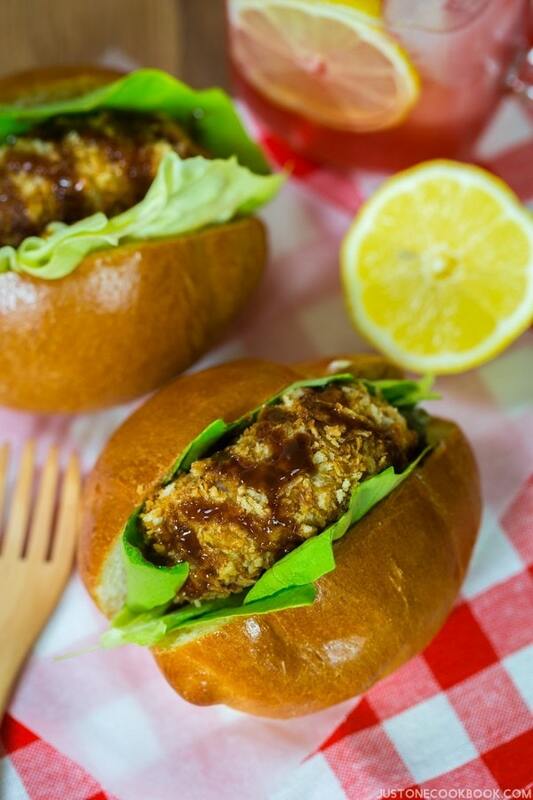 Thanks for sharing this great, easy sandwich idea, Nami! Simple and easy recipes are live savior for busy days. Tamago Sando would probably be my “go to” lunch–mainly because I LOVE Kewpie mayonnaise! Those panda picks are so adorable! I’ll check out the lunch box site. Hi Nami, thanks for visiting my blog. The tsukemono we usually find in Miami is Niitakaya. Thank you too for introducing Lunch-a-Porter to me. I love to eat this kind of sandwiches when I go to Japan, their bread and the mayo is really different. Oooh, that thick bread, for a tosto-tamago 😉 And about the Japanese mayo, is the only one we always have at home. Love it. Thanks god we can buy it in our city. I would love this bento for myself! I love egg salad on soft bread and I like it simply done like yours. Delicious! Egg sandwiches are so regressive and delicious! Your egg sando bento looks great. My kids also loved this type of sandwich while we were living in Japan. I never thought of giving them the same here in Canada, but now i will try it! Also, many Thanks for mentioning my site! I think lunch is more fun when it comes in a bento box :). Adorable! I love egg salad and would love to try this! Mmm a classic sandwich but somehow you raised it’s attractiveness levels! What a cute bento! It’s been forever since I’ve had egg salad. Awww kewpie – that’s my favorite mayo. 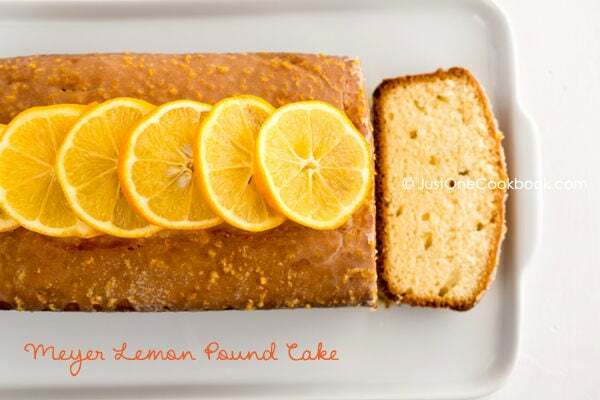 So simple and yet looks so delicious (and neat!). I’d love to have this too (and go shopping, lol). Even when it is as simple as an egg salad sandwich,you make it look so tantalizing! Great job, as always. And lovely pictures. 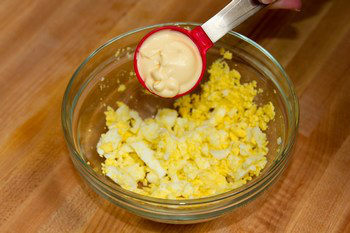 There’s a lot of be said for making a simple, straightforward egg salad like this one. Good stuff – thanks. I remember having these when I was a little girl. I LOVE crustless sandwiches cut into half. These look delicious. I love Japanese mayonnaise and prefer it over American mayonnaise most of the times. Lovely post. Hi Nami! This is simple but yummy sandwich that we make regularly at home too. Yes, it tastes much better with Japanese mayonnaise. What’s the name brand of the mayo Nami? I do the same thing with my egg salad but have not tried with the japanese mayo yet my husband said it might taste different. Hi Tina! It’s called Kewpie mayonnaise. Fell in love with the lunch box sandwich..love those little popping out bears..I wish I could have been in your home!! I think most kids would prefer crustless sandwiches, or at least mine did anyways. I’m sure your son was happy with this lunch. Especially with those cute pandas in there as a surprise. I hope you and the family are doing well. Of of these days I have to get down your way. I so know what you mean, my life and schedule is out of control right now. 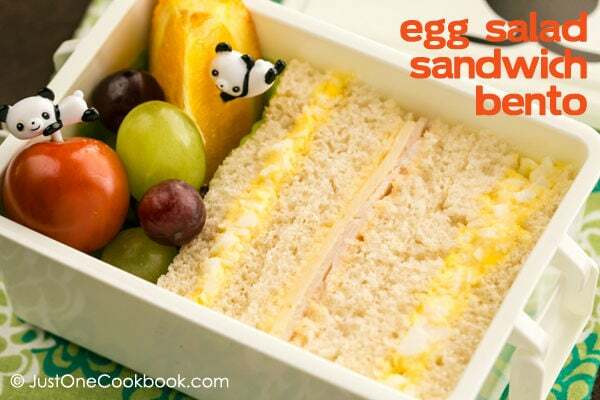 A nice preparedbento is nice but sometimes it does not beat a great egg salad sandwich. I’ll have 3. I love egg salad sandwiches too! I love how simple this recipe is. Ever since I discovered Japanese mayo, I only use it now! This is an adorable bento! Your kids are very smart…nothing better than fresh baked bread. Of course, is not easy to have at home that kind of bread, but I’m sure everybody can have that delicious egg salad…!!! These egg sandwiches look healthy and delicious. Ahhh…. egg sandwich. I recently made a dill egg sandwich. Just something fabulous about the creamy creamy filling! Gorgeous. Thank you for this! I love egg salad sandwiches, but the recipe I’ve used in the past takes too much time to prepare for a quick lunch. Your recipe is perfect for when the craving for egg salad comes on, but I have less than an hour for lunch. The pandas are so cute!! I think the version of egg salad sandwiches I grew up with was much like yours — mine never had celery or chives or anything like that either. It’s one dish I think is best kept simple. 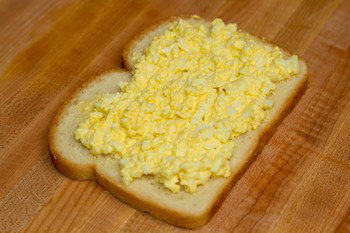 Yummy; we all love egg salad sandwiches!! Yours looks so precious lined up like that! I love egg salad sandwiches and those little panda picks are sooo adorable! Nami, what a fun post – we all get so busy at times that it seems almost impossible to manage all these food preparations on time but the idea of packing egg salad together with a turkey sandwich and some colorful veggies is a perfect lunch choice that kids always enjoy! I sometimes put left-over hard boiled and sliced eggs with mayo on the kids sandwiches and they love it! Easy to prepare but yet full of nutritious ! The pandas are adorable! What you call a last minute emergency lunch would be a well thought out one for some. You make every lunch and meal look like a special occasion. Your Bento boxes get better and better with each post! That looks like a fantastic and simple sandwich! I originally thought that the filling was scrambled eggs, but when you mentioned boiled, that seems much easier in terms of advanced preparation. And the bento-ware is very cute. 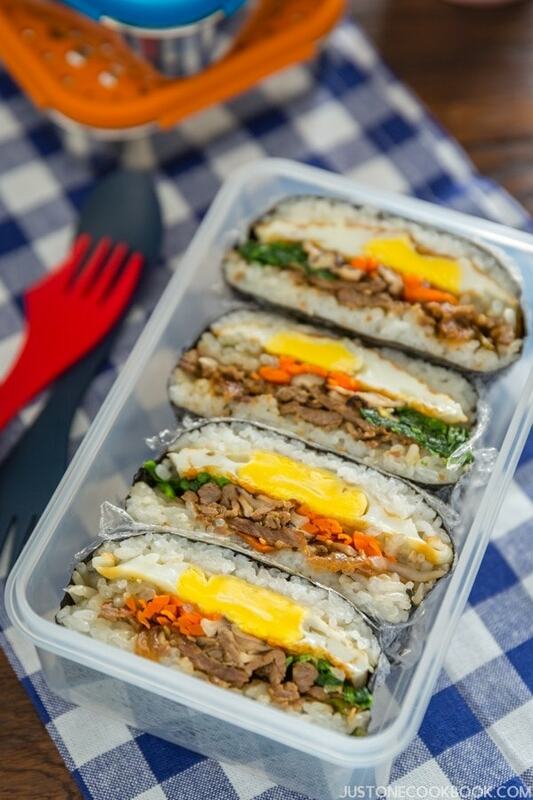 =) Thanks for sharing this quick lunch bento recipe! Egg sandwiches are so easy…and so good. I love making them on a day when there is nothing else in the fridge (we always have eggs!) And my goodness, don’t I just adore those little panda bears! What a fun way to make lunch more adorable. Thank you for sharing! Simple, delicious and perfect for any kid. I never tried Japanese mayo, sounds Delicious and not as heavy. I love your new bento box too, looks so cute. Got to check to see what I can find for my kids. I know they would love it! Yum, my favourite picnic sambo, Nami. 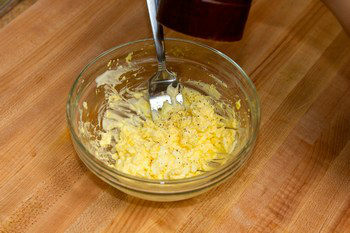 This is how I like my egg salad, without all the extra stuff. I took egg salad sandwiches with me almost every day when I was in school. I love the lunchbox and the little pandas! Egg sammies are literally my favorite go-to lunch, I can’t wait to try yours! Perfect portions! I’m fascinated by this Japanese mayonnaise! I wonder if it is something like Miracle Whip which is definitely sweeter than mayo. I love a basic egg salad sandwich. This is the cutest little school lunch ever! Hi Marianna! Thank you for finding my blog, and welcome! 🙂 I’m happy to hear you enjoy my recipes already. I’m glad the alternatives I mentioned helped. I’m still (yes still….) working on the Pantry page and hope to improve it so readers can utilize the page better. When I saw your sandwich, I remember the one I ate in Thai Airline. They provide sandwich and it is delicious. Japanese mayo is the best! My mother swore on it since I was a kid. 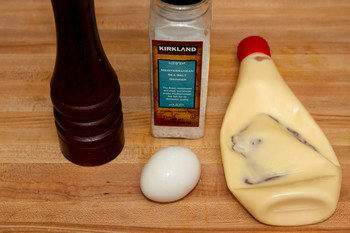 And this egg salad looks amazing. You’ve cut them up so perfectly, almost too perfect to eat! 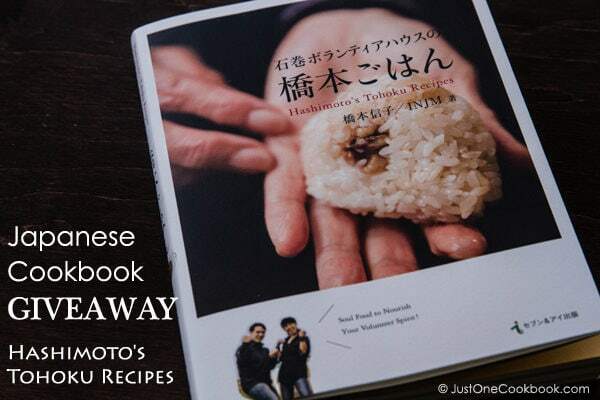 I really love your site especially to cook Japanese food for people like us who just love it. My family love the food and have made a point to have any kind of OIWAI in a nearby Japanese restaurant. Like your TAMAGO SANDO, I also make potato sandwich in a similar manner and pack a mixture of egg sandwich with potato sandwich which enlightens my kids lunch box. I would love to know how to make okhonomiyaki so that I can serve my kids with the same. Hi Aruna! Thank you so much for your kind words. 🙂 I’m happy to hear you enjoy my recipes. I do make (Japanese) potato salad sandwich too! My favorite is to put that in Japanese butter (dinner) roll. Arhhh so good! I need to make it this weekend since I now crave for it! 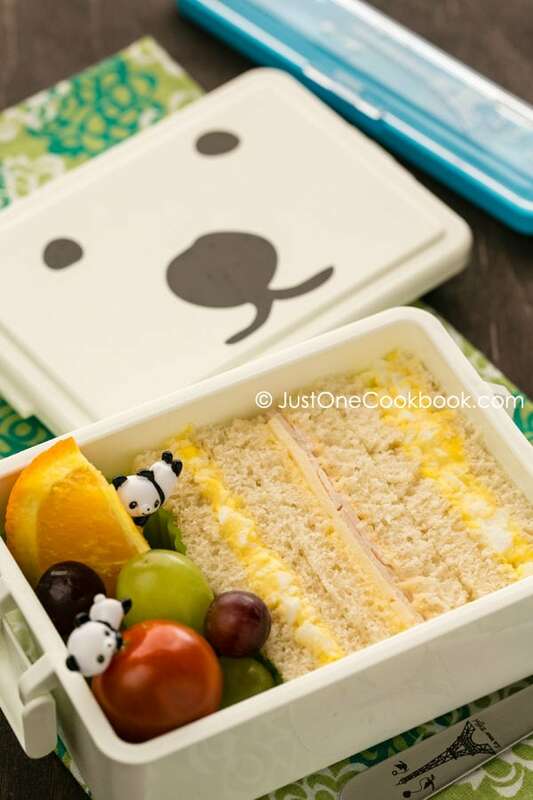 This bento might be simple but it is really inviting and I would love to have it for lunch! In Italy when you have a picknick outside you often pack bread filled with scrambled eggs… so good. Your version of cooked eggs with mayonaise sounds really good too. Nami, don’t you think that egg dishes always bring a touch of spring? You sandwiches look so cute with the panda picks and with the beautiful yellow eggs filling… Hard-boiled egg covered with mayonnaise, salt and pepper is probably the most frequent way I have eggs and I have had this combination since I was a child. I actually prepare exactly the same egg “paste” quite often (also only eggs, mayonnaise, salt and pepper, which is the way my mum did!) and sometimes add some European chives; they bring a very pleasant fresh note. Thank you for offering us the 15% off! I haven’t had an egg sandwich in such a very long time. And boy have you brought back the memories. I LOVE this and I have to make this very soon. Very cool! I didn’t know there was a difference between American and Japanese Mayos, now I do! Hi Nami, I love egg salad so much… it’s one of my favourite sandwiches, although normally I like to add watercress too for a bit of crunch and peppery flavour. I didn’t know US egg salad has funky stuff like celery inside. In England we just have egg, mayo, bit of seasoning too! When I was in Japan I found the must peculiar sandwiches in the 7-Eleven downstairs from my ex-girlfriend’s apartment… potato salad sandwich, and more strange than that… “strawberries and cream sandwich”! へえー私もこのように作ります、かなり日本的だね。耳を切るのは主人から勿体無いのクレームが。でも私は聞く耳を持ちません。Just kidding! Ha ha ha. Nice pictures! I admit I bought the Kewpie mayo at the Japanese market because it was cute, then I got addicted to it!! I love egg salad sandwiches and haven’t made them in years. I’ve started buying fresh, free-range eggs from my SIL’s friend and they are the best eggs ever. Making egg salad has totally slipped my mine until now. This bento looks SO good and has given me the idea of making one for myself this week. I have to be out of the house at lunch for 3 days and supply my own lunch so this particular bento has really grabbed my interest. Thanks Nami!!! I love your egg salad and you can’t beat homemade bread! A beautiful, simple lunch, Nami! My sons love egg salad and it’s often our back-up for lunches, too. But do you usually keep hard-boiled eggs on hand or do they get eaten as snacks? 🙂 I’m with you though – there’s definitely nights I’m too busy so we go out to dinner but then I have to worry about what we’ll eat the next day. My husband is gone all week at a conference and considering I’ve got some Japanese mayo and eggs in my fridge I think I know what one of my quick solo dinners is going to be – thanks! Ok I have to tell you no matter how hard I try and trust me I have tried really hard my bentos never look this perfect.. 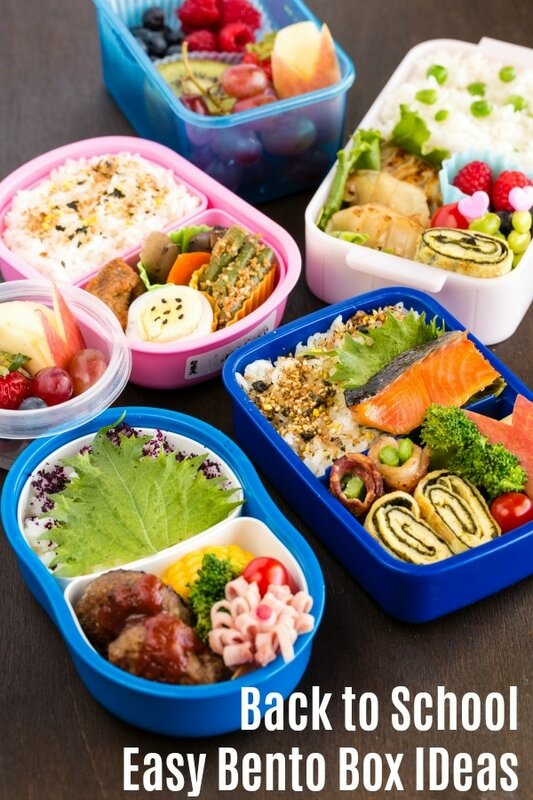 I seriously have to come n learn from you… My son will jump if I can pack such bentos for him. My boyfriend doesn’t like eggs (I know, right?! ), but I do! I’m going to try and make this for lunch next week. Thanks Nami! great idea to use Japanese mayonnaise! would like to try it. I love that you use Japanese mayo for this! I usually use greek yogurt in my egg salad but I really want to try your version! Hi, do u mash the egg the prev. day and reheat it in the morning? How to reheat it? Hi Nami.. is it okay to make this a day in advance? do i need to store the sandwich in the fridge after i make it? cause i dont have time to make it in the morning..
Will the bread get soggy if I make the sandwich the night before? Thanks so much Nami!! I made it last night and wasn’t soggy at all when I had it for lunch the next day! What should I do to avoid the bread get soggy by the time we eat in the afternoon? I use English mayo (instead of Japanese mayo) and it is moist. Really like your recipes – makes me want to cook more!